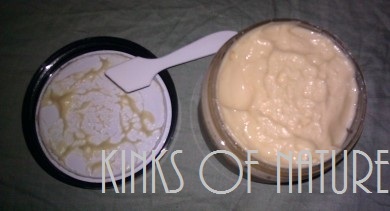 "A soft and creamy protein-free twisting and loc moisturizing cream. Twist & Loc Moisturizing Cream is perfect for twists, locs, braids and coil styles. Our rich and silky-smooth Twist & Loc Moisturizing Cream is formulated to provide intense moisture and luster to hair. It is blended with nourishing butters and oils, and natural botanical extracts that add sheen to coiled tresses, and leave hair conditioned and feeling soft. Twist & Loc Moisturizing Cream doubles as a skin softening body moisturizer!" Ingredients: Distilled water, cupuacu butter, mango butter, avocado oil, rice bran oil, raspberry seed oil, vegetable emulsifying wax, shea butter, sodium lactate (natural humectant and moisturizer), vitamin B5, organic jojoba oil, slippery elm extract, Irish moss extract, palm stearic acid (100% palm oil derived wax), phenoxyethanol and caprylyl glycol (paraben-free preservative), vitamin E, fenugreek extract, nettle extract, yarrow extract, fragrance, rosemary oil extract. Thoughts: After using it, I've come to realize the fragrance is more similar to a peach ice cream than a peach pie, and it does linger. I don't even like ice cream that much and was craving it when using this. When I used this, I was impressed with the results. I got nice fluffy moisturized hair, which was surprising considering I forgot to use a leave-in when I washed my hair. That's what happens when you decide to wash and style your hair at midnight. I was somewhat heavy-handed applying the product, especially after realizing I forgot to use a leave-in. Even so, I had no residue, whiteness, greasiness, none of that! I left my medium-to-chunky sized twists in for two days and wore them loose on the third and fourth day. The only additional moisture was my nightly routine of lightly misting/moisturizing and sealing. It has a minimal hold, but I don't think the product is meant to be used as a holding agent; it is called a moisturizing cream after all. I did use the spatulas for removing the product from the jar. I actually preferred that to using my fingers. It was less messy, and I didn't have to spend time attempting to clean my hands in between sections. I also wasn't getting water into the jar. The creams spreads very easily. Rubbing a nickel-sized amount in between my hands, leaves both palms white (similar to the way Shea Moisture Curl Enhancing Smoothie looks when spread on one's hands). For reference, it takes me about an ounce of product (stylers and moisturizers) for a full application. My hair length ranges from below-chin length (front) to arm-pit length (back) while stretched. The more my hair grows the more I appreciate and need cost-effective products and/or a good sale/discount. I was impressed with the performance of this product, but because of the price, it wouldn't be an HG for me. It'd be more of a special treat. I haven't tried it on my body yet, but if it works as well on my body as it did my hair, it could potentially become a staple. Marie Dean Twist & Loc Moisturizing Cream is available on the official Marie Dean site and the Marie Dean Etsy shop in 4oz ($12), 8oz ($18), and 12oz ($26). So would I dish out the money to purchase this?...Yep! If you haven't done so already, enter to win the Marie Dean Giveaway on Kinks of Nature. You could win an 8oz Papaya Mango Conditioner! The more tasks you complete on the Rafflecopter widget, the better your chances of winning. The giveaway closes July 26, 2012. Good luck! The Kinks of Nature discount code for Marie Dean is still active. Use the code KINKS20 when checking out to receive 20% off your order on the official site and the Etsy site. The code is active until August 31, 2012. I received my peach honey deep conditioner and mango cupuacu hair pudding a few days ago. I have only tried the hair pudding on my relaxed hair and unfortunately it did not work for me. The pudding smelled like pecan ice cream and I felt someone had dropped this in my hair. The scent does go away after a couple of hours but my hair smelt and felt dirty. It does initially feel moisturized but felt very dry 2 days into it. Not saying this is a bad product; it just does not work for my hair and the scent was very overpowering; too sweet and too candyish. Please be aware that you cant request a refund. This items are pretty pricey so if does not work for you, you cant request a refund. The only thing you can do is give it away. Hi, thanks for commenting and sharing your experience with the products.